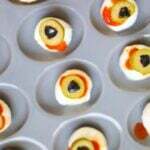 Halloween Appetizers | Mozzarella Eyeball Tray - these Halloween appetizers are so much fun to make. Mozzarella eyeballs are certain to do the trick. So easy to make with fresh mozzarella balls, olives and tomato sauce, they have a zingy little tang to them. My mozzarella balls came in water so if yours do, make sure you drain first. Then you need to pull them out and set up the tray. I find that a deviled egg holder is the perfect way to balance your cheese balls. Fill up your entire tray. Add some tomato sauce to a pastry bag or put in a baggy and snip the tinest bit off the bottom. Be careful because spahgetti sauce is runny and can come out quickly. You can also just use a spoon if you prefer. Put a little bit on each ball, letting it drip down. Cut your green olives in circles and your black olives up into tiny bits. Add the black to the center of the green. Place olives on top of your mozzarella ball till entire tray is done. You may use an image from this post with link back to the post. Did you make these? Tag me on social media with #saltysidedish so I can see!